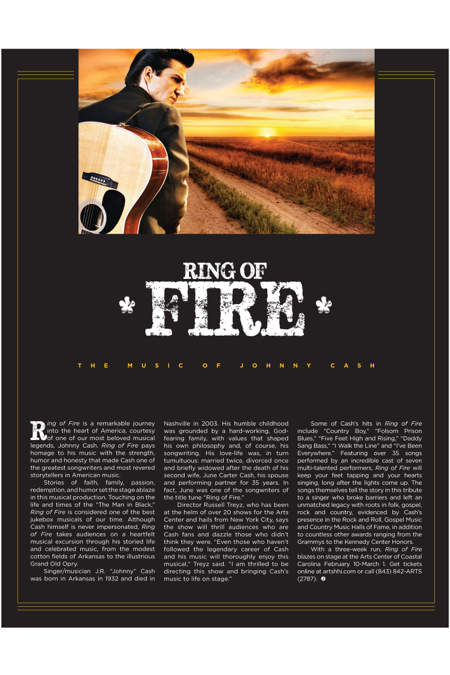 Ring of Fire is a remarkable journey into the heart of America, courtesy of one of our most beloved musical legends, Johnny Cash. Ring of Fire pays homage to his music with the strength, humor and honesty that made Cash one of the greatest songwriters and most revered storytellers in American music. Stories of faith, family, passion, redemption, and humor set the stage ablaze in this musical production. Touching on the life and times of the “The Man in Black,” Ring of Fire is considered one of the best jukebox musicals of our time. Although Cash himself is never impersonated, Ring of Fire takes audiences on a heartfelt musical excursion through his storied life and celebrated music, from the modest cotton fields of Arkansas to the illustrious Grand Old Opry. Some of Cash’s hits in Ring of Fire include “Country Boy,” “Folsom Prison Blues,” “Five Feet High and Rising,” “Daddy Sang Bass,” “I Walk the Line” and “I’ve Been Everywhere.” Featuring over 35 songs performed by an incredible cast of seven multi-talented performers, Ring of Fire will keep your feet tapping and your hearts singing, long after the lights come up. The songs themselves tell the story in this tribute to a singer who broke barriers and left an unmatched legacy with roots in folk, gospel, rock and country, evidenced by Cash’s presence in the Rock and Roll, Gospel Music and Country Music Halls of Fame, in addition to countless other awards ranging from the Grammys to the Kennedy Center Honors.